Discussion in 'Gear & Equipment Discussion' started by JDV5811, Apr 16, 2008. 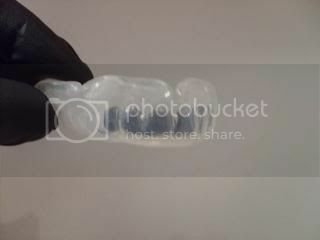 Check out my new mouth guard i ordered from starguards. Jeff was great to work with. My guard was the first of its kind with him, it having the "grill" look etc. He wasnt pleased with how it turned out, so gave me a discount and told me when the technique for this kind of look was perfected he would make me one free of charge. the customer service at this place is above all others. i encourage everyone to buy from them. lol grill look? really? haha whatever floats your boat. The quality does look awesome. why do you have psycho murdere gloves on? with that said, pic of guard in mouth plz. lol thats jeffs hands, not mine..lol those are pics he sent me. i should get it in a day or so, ill post a pic with it in my mouth wheni get it. I tell you what, I'll send you out a packet and you can let me do one for free then compare the two, give your honest opinion and let everyone know, good or bad. Go to my website and send me an email. 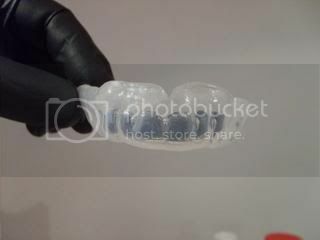 www.customguards.net I do hear that Stars does do some good work and I will not down someone I don't know personally. 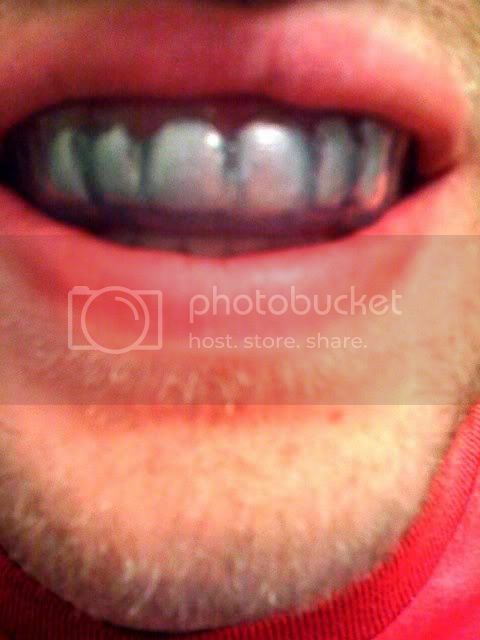 Ill take a free mouth guard and I promise to write a detailed review. Why do I never get offers for free mothguards? I have a Protech and a Starsguard to compare any freebies to. Lol! They were all out of pink! Let me know when you receive your guards! Should be by Wednesday! ...I do hear that Stars does do some good work and I will not down someone I don't know personally. thank you for the compliment, do you see a reason to "down" us though? Bobby, can you email me your address, I want you to check something out and I want to be sure your address on file is the correct one! Nice! Can't wait to get mine from Jeff. It appears from your site that you do vacuum formed guards rather than heat and pressure laminate, is this correct? I own and operate Custom Guards out of Colorado. I also train as a fighter which these days I'm doing more guards than I am training but hey, that's what pays the bills. I do a large amount of business with our local fighters here in Denver and in the Springs but I am trying to branch out. I have heard wonderful things about Stars Guards and have the same standards as they do but for some reason they have been able to jump from nobody to being way up on the market board. MMA is a huge market and as long as our prices are competitive and we produce quality then there is plenty of business to go around. Stars Guards and myself seem to have the same agenda in mind, make a quality product at the right price, the only difference is that I would rather take the impression myself which I'm sure Jeff would like to do but is not able to do. I do understand that this can not be met and that is why I have specific instructions on my web site of how to take a correct impression. I used to run a full service dental laboratory in the Springs and I would get bad impression's from dentist all of the time which does cause concern on my part but with good instructions anyone can make a good impression. If you would like to know more about the company then go to www.customguards.net There is more information there along with pictures of various guards that I have completed for fighters. Take care. you seem to have missed my question. the photos of the material on your site are for vacuum machines is that what you are using? let me start by saying I wish you nothing but success. see above for the only agenda we have. ...the only difference is that I would rather take the impression myself which I'm sure Jeff would like to do but is not able to do. I do understand that this can not be met and that is why I have specific instructions on my web site of how to take a correct impression. I don't think that is a difference, of course every lab owner wished he or she could take EVERY impression that comes through the door, but I can't send my people to Japan, Australia, the UK, etc, we have looked at setting up satellite locations, but for now we are sticking with our mail order Impression Kits, we didn't invent the wheel when it comes to mail order Impression Kits, but I would like to believe we helped take it to the next level, we use only the finest materials we have at our disposal and provide a lengthy (probably too lengthy) set of instructions, our customers receive the same kit that the guys on Team StarsGuards use. The bottom line is the customers are not getting second best, they receive the same treatment as some of their favorite fighters. i got it today, looks great in the mouth for sure. why is everyone hating the black latex gloves!? Lol! btw, I didn't think that photo would be on the forum, that's for sure!